It started with a top... A soft-to-the-touch, flared sleeve, marl grey, astoundingly cosy top. 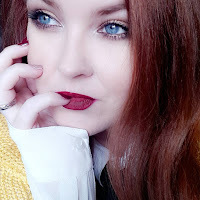 I'd spied it sitting out of place on the rails in my local Asda store recently, in the wrong size for me but other than that everything I could wish for in a top and so I searched through the store to find more in the hopes my size would be sat waiting for me to arrive - and it was! I grabbed my treasured prize and headed to the checkout, delighted with my £10 find. It's two days later and I'm still wearing it. No judging! If they had had it in black I'd have gotten that too because I've convinced myself I could legit pair this jumper with anything and everything; jeans, maxi skirts, tube skirts, trousers... in fact, it wears very well as lounge wear too due to the softness of the material. Because I found myself so incredibly taken with my new purchase, I decided to head to George online to have a little nosy at what else they might have to offer because, much as though I love the fact it's available to us locally, the in store stock could be a little better in my opinion. There are much better options online than in my local store and so the jumper served as a prompt to do some digital window shopping and boy did George at Asda come up with the goods. My focus was tops, I'm of the belief that if you have a few staples in the bottoms department ie; a pair of jeans, standard trousers and a couple of skirt options, you only need a few good tops to make it appear as though you've opted for a stylish capsule wardrobe. I was blown away by the amount of choice available at the moment and have picked out 15 favourites for you (trust me when I say I had to do a few rounds of narrowing the number down!). I'm sure you're all wondering which top triggered this lusting spree? Well, it's actually the one nestled second in the middle row, the plain bell sleeve top that nobody would really write home about only it's my favourite recent buy. The bell sleeve trend has always been a staunch favourite of mine, going right back to my teens when I used to raid my Mum's boho clothing stash and I'm always so happy to see it come back around. I spotted the bell sleeve jumper in a soft grey in my local asda and when I tried it on I realised why they had put a sticker on it boasting of a soft touch material. It's beautiful. I couldn't believe it was just £10! Heavy enough for a little warmth, light enough to wear during Spring. If it had come in black I'd have snapped that up as well! I'd thoroughly recommend picking one up for yourself, whether it's for lounge wear or incorporating into your casual wardrobe, in fact, you could style it for office wear as well. Yes, I'm having a love affair with my new jumper. Who says you need aran for that hygge feeling? 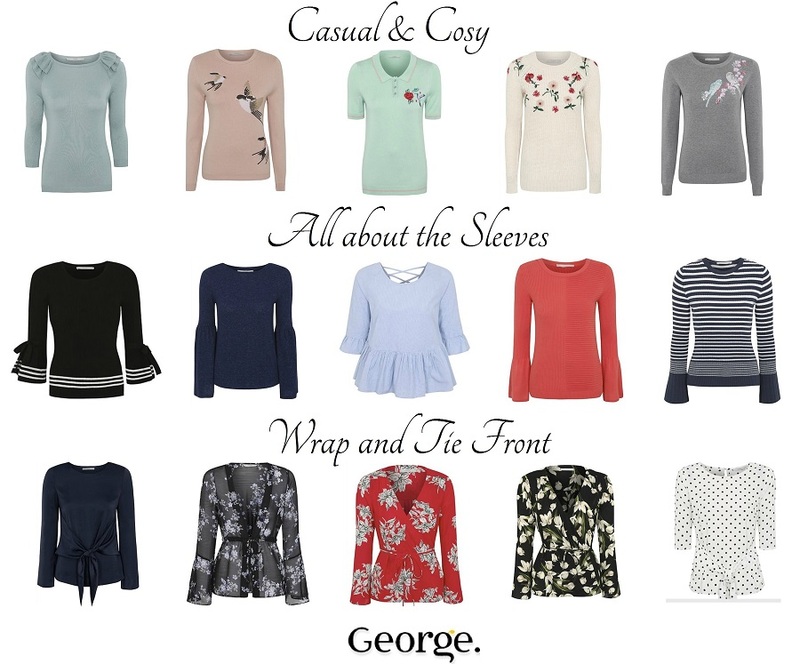 Keeping to the sleeves trend, we're seeing a few different styles catered for this season with George at Asda. For instance, if you veer towards the smart, sassy and slightly pinup / retro style of clothing this gorgeous mono Bell Sleeve Jumper with little bow details would be amazing styled with a wiggle skirt. Perhaps you're a little more conservative in your tastes and love nothing more than a breton stripe then I'd wholly recommend investing a mere £12 into this Stripe Bell Sleeve Jumper. Classic styling with a modern bell sleeve twist! There are so many pieces worthy of a mention here, such as the tie front trend we're seeing emerge again. This is such a classic cut and is perfect for drawing in the waist slightly. I spotted the beautiful Midnight Blue Tie Front Satin Top in my local Asda and can attest it's absolutely stunning. It's silky soft and drapes wonderfully on the figure, the sleeves are ever so slightly flared and the tie in at the waist is incredibly flattering. I don't opt for flattering pieces because they're flattering personally but even I couldn't ignore how this top pulled the figure in so well. (This was also available in a khaki green shade). Perfect for dressy dinners or work wear with a blazer or light jacket. I also adore the Floral Tie Front Blouse that is slightly sheer for Spring and Summer this year, pieces such as this are perfect for those of us who like to keep our arms covered in the sun but don't want to pass out from the heat (wishful thinking!). In reference to my move away from ''strictly flattering'' pieces, I spied this cute AF Striped Poplin Top and fell in love with it. These are another popular top shape emerging for SS17 and at just £12 this would be a good way to dip your toe. Incredibly easy to wear with your favourite pair of jeans, dress up with heels, dress down with trainers. Much as though we all hope for warm sunny weather to suddenly appear come March / April, our environment tends to have other ideas so a few nice jumpers are always a requirement and George at Asda have some fab knits available, in a great range of sizes from £10 upwards. My favourites worth mentioning would have to be the Ruffle Sleeve Jumper which you may think is terribly plain but the pastel blue and the frill detail make this a worthwhile investment. If you find you're being swept away by the floral and embroidery trends this season but lament the fact you are always cold then why not treat yourself to either the Floral Embroidered Jumper or the Embroidered Thin Knit Birds Jumper, I guarantee you can stay warm and not compromise on style coming into Spring 2017. A large majority of the clothing available at George at Asda range from sizes 8 to 24 which I think is fantastic! I would love to see them extend that slightly for more inclusiveness but I have to say I've always been impressed by their price points, the quality and fit of their clothing and their ability to cater to classic and seasonal trends. George at Asda is LIT right now, no doubt, so have a nosy, use the excuse you're doing a grocery shop and have a browse, try a few pieces on and treat yourself. You deserve it!